If you want to train more seriously, you need to have a plan. Every time you get on your bike, you are essentially training. Cycling is a fantastic way to lose weight. Training zones are used to quantify and track intensity. Riding on the road means that you always have to be alert and ready to take evasive action. 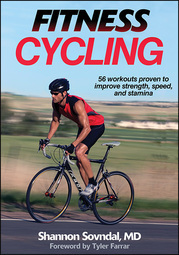 Fitness Cycling offers 56 workouts for different types of training (sprinting, intervals, hills, etc.) so active people and cyclists at all levels reach their fitness and performance goals. This attractive four-color guide provides essential information about setting goals, training, recovery, and preventing injuries. From customized workouts to authoritative advice, Fitness Cycling provides the most effective workouts for achieving peak physical conditioning. As a cyclist and physician for one of the sport’s leading teams, author Shannon Sovndal provides a detailed approach to cycling that will help you increase strength, speed, stamina, and overall fitness. Fitness Cycling features 56 workouts based on specific aspects of riding, such as base building, interval training, sprint and hill climbing, and time trialing. Each workout is color coded for intensity level, so you can create a targeted program based on your goal, current fitness level, and cycling experience. With recommendations, advice, and professional insights on riding techniques, goal setting, training concepts, recovery, and preventing common cycling injuries, Fitness Cycling is the one training guide you’ll turn to again and again for a lifetime of cycling workouts. Denver Health Medical Center and medical director at North Colorado Med Evac. He is a board-certified emergency medicine physician at Boulder Community Hospital. From 2007 to 2013, Sovndal was a team physician for the Garmin-Slipstream professional cycling team. He worked as a physician at the General Clinical Research Center at the University of Colorado from 2004 to 2012. Before becoming a physician, Sovndal raced road bikes in the United States, winning the California/Nevada District Championship and many other road races and criteriums. Sovndal is the author of Fitness Cycling (Human Kinetics, 2013). He has written numerous sport-related articles and lectured on exercise-related topics. He attended medical school at Columbia University in New York, completed his residency at Stanford University in California and now lives in Boulder, Colorado. “The best training program is one that engages you with variety and ultimately ensures that you improve. Shannon shows you how to mix it up, have fun, and go faster with Fitness Cycling." "Fitness Cycling is an excellent tool for learning the basics of cycling and for applying a variety of workouts and concepts toward attaining your cycling goals. Sovndal truly hits on the principles that matter."